Inducted 2009. 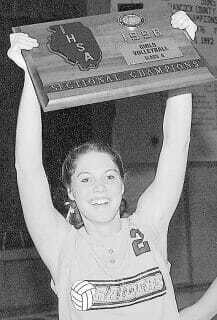 Three-Sport Standout, Went on to Star in Volleyball at SIU. Kristie (Kemner) Musick was one of the most talented female three-sport athletes in school history, but once she devoted her time to one sport, she went on to become one of the best volleyball players ever at Southern Illinois University. Musick, a 1999 graduate helped the volleyball team post a 33-10 record and win the 1998 Class A state championship during her senior season. She recorded eight kills in the title match. She led the team in service aces that season and was fourth in kills (137). She also averaged a team-high 16 points per game in basketball as QND reached the Class A state quarterfinals, and she also played softball. At Southern Illinois, Musick was named to the Missouri Valley Conference’s all-newcomer team as a freshman. She was a second-team all-MVC pick as a sophomore and a first-team choice as a junior and as a senior. The Salukis were 9-45 in Missouri Valley play during her first three years, but as a senior, she led them to a 12-6 conference record and the finals of the MVC tournament. She led the conference in kill average (4.74 per game) and dig average (4.16) as a senior, and she finished second in the balloting for MVC Player of the Year. Musick holds the career record for kills (1,660) and single-season record for kills (573). She ranks second in school history for career digs (1,355) and single-season digs (503). Musick lives in Quincy with her husband, Lance. 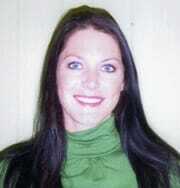 She is a speech therapist for First Choice Physical Therapy. I want to start by saying thank you to everyone who has given me so much support throughout my athletic career here at Quincy Notre Dame as well as at Southern Illinois University. I have been coached by individuals who have always pushed me to become the best athlete they always knew I could be. I have been blessed to play aside extremely talented teammates, and without them, none of my success would have been possible. For all of the Raider community, Saluki fans and “Table 9,” thank you for making each game more than “just a game.” I also would like to thank Notre Dame for providing me with a strong sense of faith, competitiveness and a “Raider Pride” that continued to fuel my success at the collegiate level. Every time SIU would play in Redbird Arena, I would remember that feeling when the Lady Raiders defeated Kansas for the state championship on that very floor. For that, I am forever grateful. Last, and most important, to my family who supported and believed in me through every game. wearing either blue and gold or maroon and white … the words “Thank You” are not enough. They always believed in me, and that belief gave me the confidence to believe in myself and reach every goal I have ever set for myself.